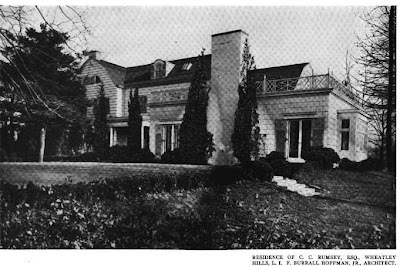 The estate of Charles Cary Rumsey, designed by F. Burrall Hoffman Jr. c. 1910 in Brookville. Rumsey was a noted sculptor and polo player (rated at 8 goals) and was married to Mary Harriman, the daughter of E.H. Harriman (one of the era's bigger railroad tycoons). 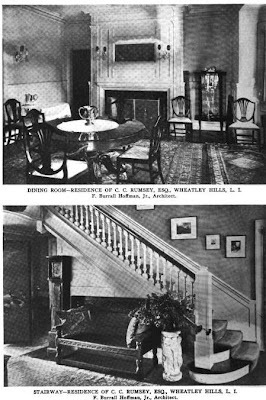 Much of Rumsey's artwork was done for associates including H.P. Whitney and August Belmont. Click HERE to see a selection of Rumsey's statues. He was a childhood friend of one of the country's best polo players, Devereux Milburn, and was known as 'Pad' Rumsey on the polo field. 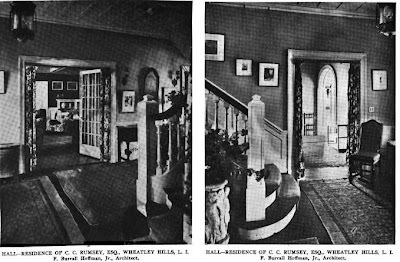 In September 1922 Rumsey took a car ride home from NYC along with two friends. As they were passing a car on Jericho Turnpike which included Mr. & Mrs. Lathrop Brown (of 'Land of Clover' in St. James), something happened which caused the car to clip the Brown's auto, hit an abutment and spin around backwards. In the midst of the chaos Rumsey and one of his friends (neither were driving) were thrown out of the car (Rumsey hit the abutment before the ground). He was dead a short while later. 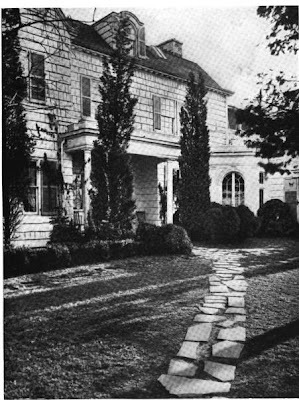 His brother-in-law W. Averell Harriman and friend Devereux Milburn went to Floral Park, the site of the accident, to collect Rumsey's body. 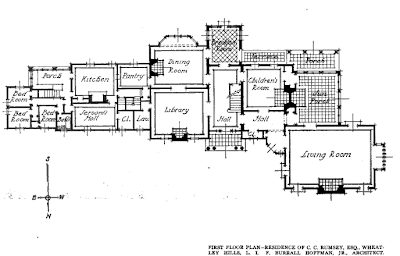 The estate was later owned by Dr. Fulton Cutting who hired Peabody, Wilson and Brown to design alterations c. 1930. Click HERE to see the Charles Cary Rumsey estate on google earth. Labels: Brookville, Estate, F. Burrall Hoffman Jr. The C.C. 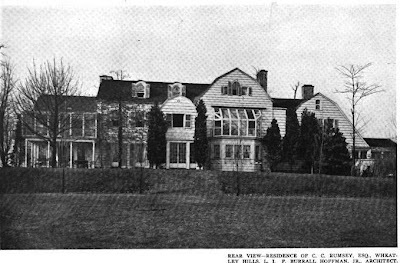 Rumsey estate sits directly across Wheatley Road from 'Big Tree Farm', the James N. Hill estate. Hill's father, James J. Hill, and C.C. Rumsey's father-in-law, E.H. Harriman, battled each other in 1901 for control of the Northern Pacific railroad. This led to a panic on Wall Street as the two fought for control. Hill, along with J.P. Morgan, came out on top and formed the Northern Securities Company which was soon broken up under the Sherman Antitrust Act. I do believe this house, from the looks of it, qualifies as "a hot mess." Way too much going on with that rear façade, so much so that I don't know here to look. The house was much improved by the Cutting alterations which substantially simplified the facade and made it look like what I'm sure was Burrell Hoffman's intent- a Colonial farmhouse that had been added onto over the years. The house has been closed for a number of years and is sadly much decayed, although Cutting descendants still own the property. The house is surprisingly large and the proportion of the rooms gigantic which is not apparent on the floor plans.